This whole thing has become a needless controversy and I don’t recall ever releasing this many sighs while writing an article before. 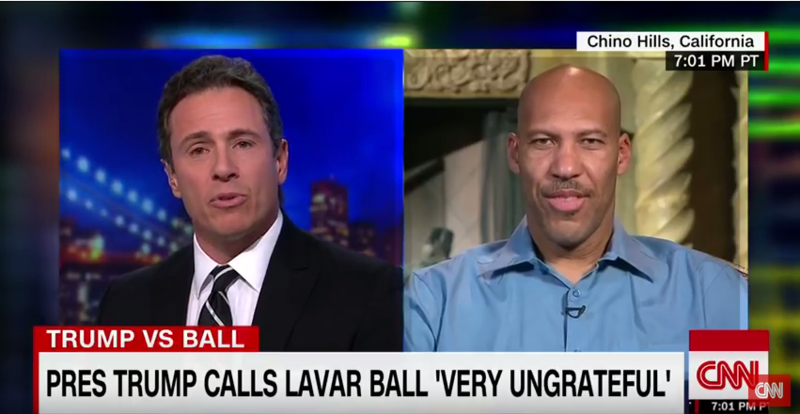 LaVar Ball, the ungrateful father of the disrespectful brat LiAngelo Ball – arrested in China for shoplifting from a Louis Vuitton store – is continuing his campaign of hate toward President Trump, who had a hand in bringing Ball home and avoiding prison time. In an interview with CNN’s Chris Cuomo, Ball once again stated the Trump would be receiving no praise from him and instead chose to thank Chinese President Xi Jinping for his son’s release. No wonder his son was arrested for theft, the boy learned his blatant lack of respect from his father! “Did he help the boys get out? I don’t know. […] If I was going to thank somebody I’d probably thank President Xi (Jinping),” Ball said. He says that there is no proof that Trump actually did anything to get his son and the other two basketball players released, meaning that he doesn’t know if the American President actually deserves any thanks. Trump insists that his quick action was critical in helping get the college students released and avoid prison time. “It wasn’t like he was in the U.S. and said, ‘OK, there’s three kids in China. I need to go over and get them.’ That wasn’t the thought process,” Ball criticized. No, you’re right. And it’s not his responsibility to get them released either. He happened to be there at the time and brought it up with the Chinese President, who I assure you would have no problem jailing your little brat and his friends. But the father went even further, suggesting that he deserve some of the credit for his son getting released too. These are the lessons that this man is teaching his son. The sad thing is, he thinks he’s in the right as well. It will not kill you to thank a President for helping get your son out of what could have become an extremely sticky situation. Unless you’re afraid it might change your outlook on the President, in which case you also need to do some soul-searching.